A map tells many things. It shows cities, towns and interesting places. It helps you to see how far one place is from another. It can show waterways, mountains and rivers. It gives you a picture of the way an area of the world looks. Historic sites from the 19th Century that exist today. States where slavery was allowed, and states where slavery was prohibited. 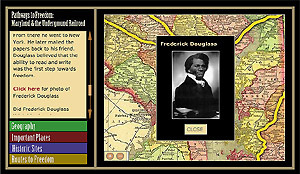 Three routes Maryland slaves followed to freedom. How did the geography of Maryland sometimes help and sometimes hurt escaping slaves? Why was the Mason-Dixon line so important to escaping slaves? These are just a few of the questions that this map can help you investigate. PLEASE NOTE: This interactive requires version 5 or later of the Flash Player plug-in and works best on 4.0+ web browsers. To get the free Flash Player, click on the button below.